Although air power was the cutting edge of Task Force 77, surface ships were essential to the interdiction campaign in North Vietnam and Laos. In Operation Sea Dragon, begun in October 1966, cruisers, destroyers and for one month, battleship New Jersey (BB62)ranged the North Vietnamese littoral sinking Communist supply craft, shelling coastal batteries and radar sites, and complementing the aerial interdiction effort by bombarding the infiltration routes ashore. While at first restricted to coastal waters south of 17 31’N, by February 1967 the Sea Dragon force was authorized to operate as far north as the 20th parallel. This area was constricted in April 1968 when the bombing halt ended American combat activity north of the 19th parallel. Steaming generally in pairs, the two to four American and Australian destroyers and one cruiser worked with carrier-based spotter planes, such as A-1 Skyraider and Grumman S-2 Tracker, to find, identify, and destroy infiltrating vessels and shore targets. Often, North Vietnamese coastal batteries fired back. Although several of the 19 ships that were hit required repairs at shipyards in Japan and the Philippines, no vessel was sunk during the two-year long Sea Dragon operation. Damaged ships were quickly replaced on the gun line and the coastal deployment was maintained. Periodically, this group reinforced the Seventh Fleet cruisers and destroyers providing naval gunfire support to allied forces in South Vietnam. The naval surface group conducted the Sea Dragon effort until the end of October 1968, when American combat operations in North Vietnam ceased. Napoleon declared that an army marches on its stomach. Contrary to popular mythology, North Vietnamese regulars and Viet Cong guerrillas were not exempt from this time-honored adage. they were dependent on the vast quantities of food and munitions smuggled across South Vietnam’s shores and waterways. It was because of this waterborne logistic highway that the destroyers Mansfield and Hanson sailed north toward the 17th parallel before dawn on October 25, 1966. At 0500 hours, the ships entered North Vietnamese waters and opened a new phase of the war, attacking WBLC (pronounced “wiblic” and meaning waterborne logistic craft and coastal lines of communications) targets still in Communist waters. As part of Operation Sea Dragon, Seventh Fleet destroyers, cruisers and eventually one battleship participated in this new mission between October 1966 and November 1968. The two warships closed to within 14,000 yards of shore by midmorning and engaged coastal shipping near Dong Hoi. After five hours in North Vietnamese waters, coastal defense batteries fired on the ships at 0951. the Mansfield and Hanson turned to open sea while their aft 5-inch guns engaged the shore artillery with counterbattery fire. 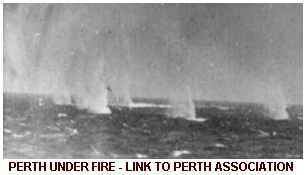 The destroyers escaped unscathed and returned to fire on other targets throughout the day, drawing additional, although equally inaccurate, fire twice more that afternoon. North Vietnamese representatives a the the United Nations complained to the International Control Commission the next morning about the new U.S. “escalation of war.” Despite the protest the operation continued. By the end of October, destroyers assigned to Operation Traffic Cop,[ Logistics Map ] the initial phase of Sea Dragon, sank 101 watercraft and damaged another 94 with 928 5-inch projectiles. during the same period, counterbattery fire accounted for another 426 shells. Seventh Fleet achieved these impressive results without the loss or damage to a single ship or sailor. Life aboard Sea Dragon destroyers proved stressful and tiring, yet morale consistently remained high-better, in fact, than morale on similar ships to the south. 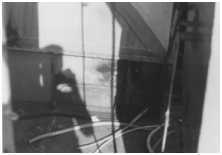 This resulted from a combination of frequent and true action by destroyer crewmen, immediate results from their efforts, and the possibility of being shot at. On patrol, one-third of the crew typically remained at battle stations, with at least one gun mount fully manned while the rest ate, slept and performed routine shipboard duties. In the CIC, radarmen kept constant vigil over surface and air search radars, while receiving contact reports from surveillance aircraft and other vessels. Once a target was located and identified, the captain normally ordered general quarters and gave permission to fire. the gunfire direction officer, sometimes aided by spotter aricraft, adjusted spotting rounds before announcing, “All mounts, both guns, two salvos.” Less than 15 seconds later, 5-inch rounds reached the unfortunate ship or shore target. Skippers sometimes deviated from this pattern, especially when engaging a single WBLC and if his ship was beyond coastal gun range. In these cases he might engage the target with the ready mount and forgo the call to general quarters to save wear and tear on his already well-worked crew. Just four days after Sea Dragon expanded to the 18th parallel, the JCS changed the rules for engaging shore batteries. This occurred when the enemy shore-based search radars “painted” several destroyers with their radar waves, and the U.S. government authorized the ships to attack the sites. At 1046, December 23, 1966, events took an anticipated but little-publicized turn when the USS O’Brien DD-725 took a direct hit from a 75mm shore battery at a range of 7,800 yards. Three minutes later, while engaged in counterbattery fire, she received a second hit that caused moderate damage to the aft deckhouse. A call for assistance went out. At Yankee Station, four carriers launched ready aircraft that supressed the Communist artillery. That evening the Benner relieved O’Brien as she retired to Subic Bay for repairs with two dead and four injured. Sea Dragon destroyers amassed an impressive record by year’s end: 382 watercraft destroyed and 325 damaged; five coastal defense batteries destroyed and two damaged; and two radar sites destroyed with another two damaged. Just as significant, the aggressive operation forced a majority of waterborne logistic traffic between Dong Hoi and the South to divert to crowded land routes or into less efficient inland waterways. Also, because of concentrated coastal defense artillery in the limited Sea Dragon area, Admiral Sharp asked the JCS to increase the number of destroyers dedicated to the mission and the enlarge the Sea Dragon area to dilute enemy shore fire. The Royal Australian Navy’s guided missile destroyer, HMAS Hobart, was assigned in March 1967 to duties with the US 7th Fleet in the South China Sea and in the Gulf of Tonkin. 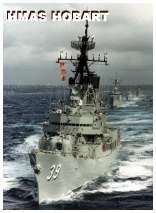 Hobart, being the first RAN vessel to arrive in Vietnam under combat conditions, participated in Operation Rolling Thunder’s maritime equivalent, Operation Sea Dragon. This was designed primarily to intercept Water Borne Logistic Craft (WBLC) and bomb military and logistic targets north of the DMZ. Sea Dragon was suspended in November 1968 during HMAS Perth‘s second deployment. The following is from Australian Ray Thomas, Melbourne, Australia. “Yes I do have a “little” info for you, they are extracts from an Australian Department of Defence publication, printed by the Australian Government Publishing Service (Canberra 1980).The book details are ROYAL AUSTRALIAN NAVY IN VIETNAM A record of the Royal Australian Navy in the Vietnam War 1965-1972 by Dennis Fairfax. I will quote the two mentions of the Mansfield, anything in brackets is for your info. After this, RAN vessels’ primary task was to provide Naval Gunfire Support (NGFS) for ground operations near the coast. HMAS Hobart was engaged in bombardments tasks of the coast, destroying Vietcong supply routes and installations. She also spent periods of duty on Operation Sea Dragon, employed in the destruction of enemy waterborne logistics craft off the coast of North Vietnam and on numerous occasions was engaged in battles with enemy coastal batteries. In September 1967 Hobart was relieved by her sister ship, HMAS Perth, and the two ships alternated in six monthly tours of duty in the Vietnam area until 1969 when HMAS Brisbane and then HMAS Vendetta carried out tours. HMAS Hobart returned to Vietnam in March 1970 for her third tour. HMAS Vendetta was the first Australian built ship to serve in Vietnamese waters. Both HMAS Hobart and HMAS Perth were awarded the U.S. Navy Unit Commendation for Vietnam service. 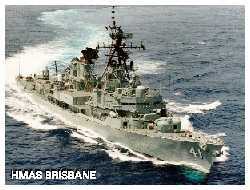 HMAS Brisbane, the last Australian destroyer to serve in Vietnam left the war zone in September 1970. Reflecting the ease with which fleet units moved between operational theaters, in May, Sea Dragon and Task Unit 70.8.9 combined forces off the DMZ in the strongest concentration of American surface gunfire ships since the Korean War. Cruisers Providence and Saint Paul and five destroyers took part in Operation Beau Charger, an amphibious landing and sweep into the southern half of the DMZ. In May, Sea Dragon combatants temporarily withdrew south to join Task Unit 70.8.9 in Operation Beau Charger, the largest concentration of U.S. surface warships since the Korean War. During the operation, Canberra combined forces with the light guided-missile crusers Providence and St. Paul and five destroyers to support Marine amphibious landings and fround sweeps in the southern part of the DMZ. during the assault, the ships supressed Communist artillery in southern North Vietnam and in the upper half of the DMZ. Back in North Vietnamese waters later in the month. Sea Dragon supplemented a Rolling Thunder attack on the Quang Khe ferry complex that sank more than 40 watercraft. Communist coastal defense sites increased in number and accuracy in the following months. Significantly, most now used search and ranging radars. With the improved equipment, Communist gunners began to engage U.S. ships more frequently and at ranges to 15,000 yards. By mid-June, they had fired against Sea Dragon on no fewer than 87 occasions, and the number of ships hit by coastal defense batteries increased. As shore gunnery improved, Sea Dragon unites employed new tactics and additional countermeasures of their own. In addition to evasive maneuvers during an attack and engaging targets from a greater distance (averaging 17,300 yards by July), the ships used chaff, electronics and smoke-all with uncertain results. The Fleet also experimented with “Snoopy,” a remotely piloted dorne used for spotting. Deployed for the first time by the Mansfield, early models suffered from mechanical problems and a jittery camera that plagued the system. With more engineering and wider application, Snoopy eventually provided the fleet with valuable information. The fleet’s surface ships were essential for dealing with the many Communist artillery batteries that fired into South Vietnam from positions in the northern half of the DMZ and southern North Vietnam. In addition, enemy coastal guns menaced allied ships and craft offshore. 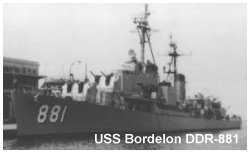 On 29 August 1967, DuPont (DD-941) lost one sailor killed and nine wounded when one of the 40 Communist shells that straddled the ship hit home. 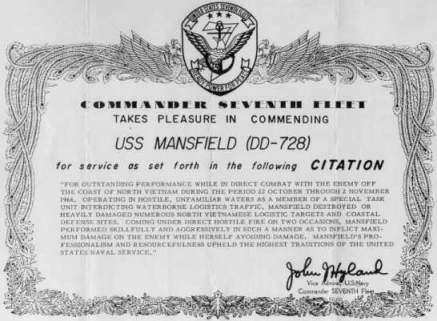 the following month, on the twenty-fifth, Communist fire struck Mansfield (DD728) killing one bluejacket and wounding another two men. If you are on Cape Cod and would like to pay your respects to Richard Archer, go here for directions to Oak Neck Cemetery. 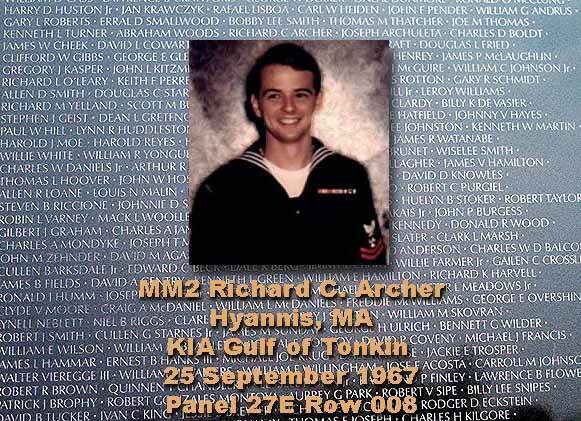 Please visit Dan “Jake” Jacob’s Tribute Page to shipmate Richard Archer. 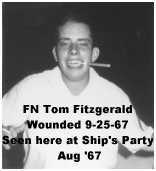 For a list of all Com7th Fleet Vietnam War Ship Casualties, please go here. The naval force, however, returned this fire many fold. With six or seven destroyers continuously deployed offshore in I Corps by November, enemy coastal gun emplacements and field artillery positions often were blanketed with naval gunfire. Indeed, the surface ships fired 500,000 rounds in 1967, approximately twice as many as they had the previous year, with the great majority of them falling on I Corps targets. The enemy’s Tet Offensive in the first half of 1968 engaged the Naval Gunfire Support Unit in its heaviest combat actions of the war. drawing on resources from all areas and commands, but especially from Operation Sea Dragon, Commander Task Unit 70.8.9 concentrated as many as 22 ships at one time on the gun line. These ships maintained high rates of fire during this crisis period, with the heavy cruiser Canberra (CAG 2), guided missile light cruiser Providence and seven other surface ships poured fire into enemy targets in Hue, including the fortified Citadel. this naval support was critical to the allied recapture of the old Imperial City. the following month, Newport News (CA 148) reduced the flow of ammunition to desperately fighting enemy units when it destroyed an NVA logistic complex north of the Cua Viet River. 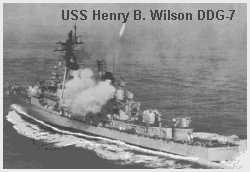 In another instance, in May Henry B. Wilson (DDG 7) decimated a North Vietnamese battalion, killing 82 of the unit’s troops. In similar actions during the first eight months of 1968, naval bombardmanets inflicted over two thousand casualties on the reeling Communist forces. Thus, during more than three years of deployment offshore, the Naval Gunfire Support Unit had become a valuable component of the allied forces defending South Vietnam. Although Sea Dragon failed to stem the flow of men and supplies south, it forced the Communists to divert much of their logistics support to less efficient land routes, primarily the Ho Chi Mihn trail. Those stores that continued by water were by and large diverted from coastal waterways to smaller inland rivers that required frequent offloading and portaging to connecting channels. Moreover, the elimination of large-scale coastal infiltration forced Hanoi to employ tens of thousands of potential troops at the less effective business of defending the coast and manhandling mountains of munitions and provisions to Communist forces below the DMZ. The following story was sent to me by Jerry Williams who was aboard the USS Epperson DD-719. The Epperson was out with the Mansfield on Operation Sea Dragon. USS MANSFIELD FIRED AT ENEMY POSITIONS IN THE I CORPS AREA ON 9 JUNE 1968, TO FINISH HER LATEST VIETNAM CRUISE. ACCURATE DAMAGE ASSESSMENTS WERE DELIVERED BY CW-2 ROGER M. OLSON, FROM ANAHEIM, CALIFORNIA AND CPL J.M. KEEMUN, JR., FROM BELZONI, MISSISSIPPI, OF THE 1ST AIR CALVARY, U.S. ARMY, THE AIRBORNE SPOTTERS. THE TARGETS WERE LOCATED ALONG A HIGHWAY KNOW AS “THE STREET OF NO JOY”, SIXTEEN MILES NORTH NORTHWEST OF HUE. AT THE FIRST TARGET ON LARGE MASONRY STRUCTURE WAS DAMAGED, THREE STRUCTURES DESTROYED, AND TWO BUNKERS WERE DAMAGED. THE DAMAGE TO THE SECOND TARGET WAS MORE EXTENSIVE. ONE LARGE MASONRY STRUCTURE DAMAGED, THREE BUNKERS DESTROYED, FIVE STRUCTURES DESTROYED, TWO STRUCTURES DAMAGED, AND TWO BUNKERS DAMAGED. THE AIRBORNE SPOTTERS WERE ABLE TO CONFIRM THREE ENEMY KILLED IN ACTION. THE RAPID FIRE PUT OUT BY MANSFIELD’S MOUNT CREWS CAUSED CPL J.M. KEEMUN TO REMARK, “YOU ARE THE BEST SHIP I EVER WORKED WITH. I SAW SHOOTING THIS AFTERNOON THAT I FOUND HARD TO BELIEVE MYSELF.” THIS FIRING, ONLY HOURS BEFORE BEING RELIEVED, PUT MANSFIELD OVER THE 40,000 ROUND MARK AND PLACED IT MORE SOLIDLY AS THE “TOP DESTROYER GUN” OF THE VIETNAM CAMPAIGN. THE COMMANDING OFFICER, COMMANDER JACK R. GRIFFIN, USN, FROM LONG BEACH, CALIFORNIA, SAID IN HIS REMARKS TO THE CREW, “I KNOW THAT ALL OF US ARE GLAD THAT OUR LAST DAY ON THE GUNLINE WAS SO SUCCESSFUL. I AM PROUD OF YOU ALL AS YOU SHOULD BE OF YOURSELVES”. For more Navy history go here.